Ingredients: aqua (water) / eau, glycerin, dipropylene glycol, peg/ppg-14/4 dimethicone, carbomer, peg-40 hydrogenated castor oil, phenoxyethanol, glycol distearate, lavandula hybrida oil, maris sal (sea salt) / sel marin, sodium hydroxide, laureth-4, sodium laureth sulfate, chlorphenesin, cupressus sempervirens oil, cananga odorata flower oil, cocamidopropyl betaine, cymbopogon martini oil, propylene glycol, coco-glucoside, citric acid, pentaerythrityl tetra-di-t-butyl hydroxyhydrocinnamate, triisopropanolamine, linalool, geraniol, limonene, benzyl benzoate, farnesol, benzyl salicylate, coumarin, citral, eugenol. Anne Semonin believes that everyone's skin is unique, and their beauty routine should be too. 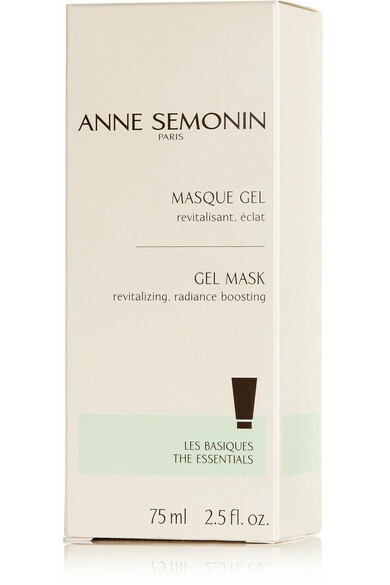 Perfect for those with tired, dull or maturing complexions, this refreshing gel mask is packed with essential oils including Cypress and Ylang Ylang to stimulate cell renewal while boosting hydration and radiance. Plus, it's also blended with marine trace elements like Sea Water to improve elasticity and plump skin. For best results, use it after the brand's cream mask.